EduBUILD is Africa's only education buildings and infrastructure conference and exhibition for education leaders and decision-makers involved in design, construction, renovation, maintenance, operation and management of buildings for schools and universities. This two day event is co-located with Africa's largest annual education meetup – EduTECH – and features a senior-level congress, peer-to-peer round tables, 1-to-1 meetings and a large exhibition ….perfect for gathering information about the latest education building projects, discussing new tenders, forging partnerships and doing business. EduBUILD Africa is the symbol of just how much potential Africa holds for education buildings and infrastructure. 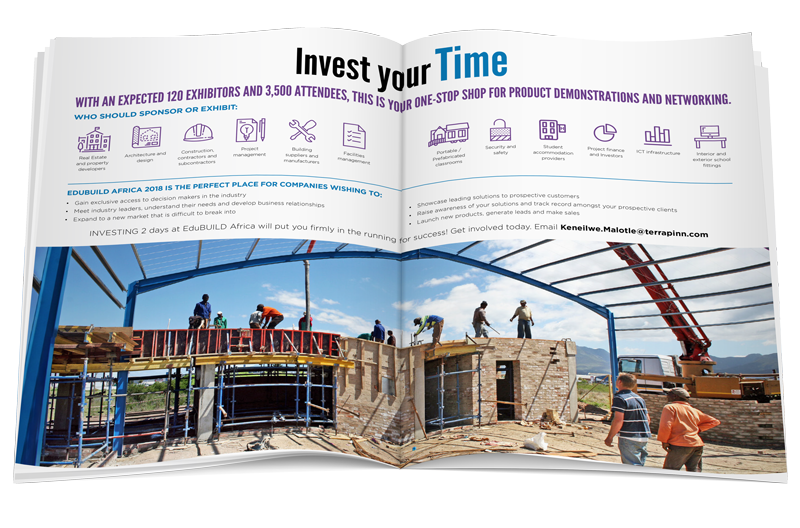 Get the exhibitor brochure for an overview of the event and to see sponsorship, exhibition and speaking opportunities. EduTECH Africa prides itself on bringing together thousands of educators from across Africa to evaluate and plan the future of technology in learning. Part of a series of events that spans the globe, attendees benefit from the very latest in teaching strategies, cutting edge technologies and collaboration opportunities. Join us!